At Preston’s Beauty Academy, we’re committed to providing a quality education to those pursuing a career in beauty. A beauty license is an amazing way for individuals to kick-start new careers in their area of passion, but it can be hard to know where to begin. Not only must you master beauty skills so you do a great job for your clients, but you also need to know how to manage your career, especially if you’re considering one day going into business for yourself. It can be hard to stay focused and persistent, which is why we help our students develop not only the techniques and skills they need to succeed but also the right mindset. We are licensed in Ohio and West Virginia, and we provide a few different licenses, depending on your focus. These licenses will allow you to comply with all regulations for your chosen beauty field, giving you everything you need to start your career. Altogether, our academy has helped over 200 students achieve their beauty licenses over the past 11 years, with 99% of our students completing their graduation. If you’d like to chat with us about launching your beauty career, give us a call at (740) 372-5434 or fill out our online contact form and we’ll be in touch! 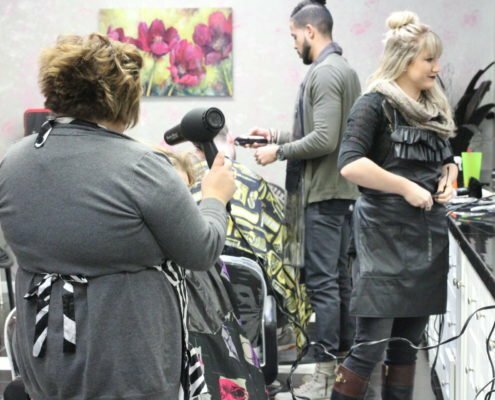 As a beauty school service Columbus, Ohio, we have students who come from many different cities in Ohio and West Virginia. If you’d like to know more about our teaching philosophy and the programs we offer, keep reading. To make sure our students get a well-rounded education, we take a three-pronged approach to our training. 1) Basic Training: First, we start with good old-fashioned learning. Before you practice techniques, it’s important to understand the basics about your work, which includes lessons on anatomy, chemistry, and sterilization. You’ll likely be working with a number of chemicals that are applied to your clients’ hair, face, and nails, so it’s important that you know what you’re working with. 2) Hands-On Work: After you’ve developed a good understanding of the basics, it’s time to get some hands-on experience, which is a large portion of your training. At our academy, we provide a number of clinical services to our clients, which we provide at a discounted rate so that our students can gain practical experience. All of this work will be done under the guidance and supervision of our expert instructors so that you can learn how to improve each and every session. 3) Mindset Training: While you now understand the techniques of the work you’ll be doing in your beauty career, it’s also extremely important to know how to manage that career. In the service world, technique and skill are only part of the equation; the rest is knowing how to stay confident and focused, how to treat your clients well, and how to work with integrity. Altogether, our program is designed with one purpose: to help our students succeed in their careers as beauty professionals. We aren’t interested in teaching some basic skills and then expecting you to figure the rest out on your own. Instead, we want to support every aspect of your new career, which is exactly what our curriculum reflects. While the differences might seem obvious, we’ll take a closer look here at the specific differences; and, if you have any questions, don’t hesitate to reach out to talk about which would be right for you. If you’re looking for a license that will give you the skills needed to work in nearly any area of the beauty world, especially haircutting and styling, then this is the program for you. If you’re hoping to become a professional makeup artist, then this is for you! If your goal is to work at a nail salon – or open your own – then this is the license you’re looking for! Our academy was founded and is run by Melanie Preston, a beautician and entrepreneur who owns and manages a number of successful businesses in Ohio and West Virginia. She’s passionate about helping others start their careers in the beauty space and aims to provide her students with the tools, techniques, and mindset needed to be successful. If you’re in the Columbus area and would like to learn more about Preston’s, get in touch with us today! You can call us at (740) 374-5434 or fill out our online contact form to get started.